Leading the Apple Inc. (NASDAQ:AAPL) rumor mill today is news of HomePod sales estimates for 2018. Today, we’ll look at that and other Apple Rumors for Friday. HomePod Sales: A new sales estimate has Apple selling way less HomePod smart speakers than expected, reports 9to5Mac. This new estimate claims that the tech company may only sell between 2.00 million and 2.25 million units of the smart speaker during 2018. If this does happen, it will be much lower than other estimates, which are looking at 10 million units selling in 2018. These new estimates come from KGI Securities analyst Ming-Chi Kuo. Other recent reports have also claimed that HomePod sales have been disappointing since its launch. Smart Keyboards: Owners of some Smart Keyboards for the iPad Pro just got an extended warranty, AppleInsider notes. This new warranty is for the first generation of Smart Keyboards made for the 9.7-inch and 12.9-inch iPad Pro. Several customers have been having problems with the keyboards. This includes unresponsiveness, keys sticking and more. As a result, AAPL is extending the warranty by three years. RED iPhone 8: Customers can now stop by Apple Stores to get their hands on the (PRODUCT)RED iPhone 8 and 8 Plus, reports MacRumors. This also means that those ordering the devices online can chose to pick them up in store today. The new smartphones continue the tech company’s recent tradition of launching (PRODUCT)RED versions of its smartphones a few months after the initial launch. However, there isn’t a (PRODUCT)RED iPhone X available. 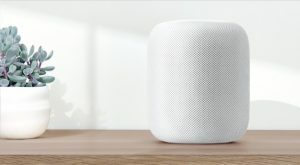 Article printed from InvestorPlace Media, https://investorplace.com/2018/04/apple-may-only-sell-2-million-homepods-in-2018/.